If you have any accessibility requirements and this is your first time at the Royal Opera House, or if you have not joined our Access Membership, our first suggestion would be to contact the Box Office on 020 7304 4000 (boxoffice.access@roh.org.uk) to discuss your visit. We encourage all disabled customers to join the Royal Opera House Access Membership as this will help us meet your accessibility requirements. We are committed to making your visit as enjoyable as possible and can assist you in all aspects of your booking. Our dedicated team can advise you on our facilities and discuss any particular requirement. For information on ROH Access Membership and to request a registration form, please contact the Box Office on +44 (0)20 7304 4000 or download an Access Membership registration form below. Download the Access Membership Registration Form (PDF, 3MB). Personalized assistance in all aspects of your booking from our dedicated team. Personalized seat allocation, based on your seating preferences, subject to availability. Access to our season guides (Audio Season Guide available). Booking via website, phone, in person or by booking form. Priority booking and reduced price tickets for British Sign Language users for interpreted performances, subject to availability. Reduced price tickets available to Members who are in receipt of disability-related state benefits (proof of eligibility required - please see registration form or contact boxoffice.access@roh.org.uk for further information). One complimentary ticket if you require continual supervision/assistance throughout the performance (proof of eligibility required – please see registration form or contact boxoffice.access@roh.org.uk for further information). N.B: The Royal Opera House reserves the right to cancel and refund any discounted or complimentary tickets that contravene our discount/complimentary ticket booking policies. Please allow up to two weeks for your Access Membership registration to be processed. Have you previously used our Access services? Please let us know what you think by completing this survey. Access members can book online, over the phone, in person or by booking form (download link available to all Access Members at the onset of each booking period – printed version available on request). We recommend that Access Members make themselves as familiar with the seating as possible before making a booking. If in doubt, please contact the Box Office Access department on 020 7304 4000 or email boxofficeaccess@roh.org.uk. Please also take a moment to make yourself familiar with the three seating plans below, which detail the position of exits, lifts, toilets, access to surtitles, and the number of stairs necessary to access each area of seating. Please ensure that you sign in to your Access Membership account before making an Access booking online. Once you have completed your booking, please notify the Box Office Access department of any additional accessibility information you think might be relevant to your booking. Please sign in using the email you provided on your registration form. If you have not previously signed in, you may need to click on the ‘Forgot you password?’ link, and create a password. If you have not provided an email, or have used your email address for someone else’s account, please email boxoffice.access@roh.org.uk so we can create an Online Access Account for you. We will then set you up online and email you a simple set of instructions on how to sign-in and navigate your account. Please DO NOT go ahead and set-up an online account independently, as this will result in multiple booking accounts, problems with your log-in and your online account not possessing the relevant Access information or, where applicable, discount eligibility. If you make an Access booking online and have particular requirements of which we and Front of House need to be aware (such as a wheelchair transfer; loan of House wheelchair; accommodation of portable oxygen facility; presence of an assistance/guide dog; Assisted Hearing Facility; Audio Introduction request; Assistant Pass request, etc), please ensure you notify boxoffice.access@roh.org.uk as soon as possible, so we and Front of House can accommodate you accordingly. For those eligible, both the 25% discount on your own personal ticket and the free companion ticket are applicable to one performance per production (ie, one performance in a run of Alice’s Adventures in Wonderland, one performance in a run of Rigoletto, etc). If you wish to see more than one performance of the same production, any additional bookings will be charged at full price. Any bookings that exceed this limit will be invalid and tickets will not be issued. We advise that customers with mobility impairments, who may need to use a lift to access the auditorium, arrive early. Our lifts are often in high demand for performances, and it may take a while to get to your seat. There is lift access to all levels of the Main Auditorium except the Orchestra Stalls, which can be reached by a minimum of nine steps and a maximum of 18. There are more than 100 seats in the Stalls Circle, Balcony and Amphitheatre which are accessible without the need to negotiate steps. In addition, many seats in these areas and in the Grand Tier are accessible by 10 steps or fewer. Auditorium left provides easy access to the Paul Hamlyn Hall and Crush Room. Auditorium Right provides easy Access to the Amphitheatre Bar and Restaurant, and the Crush Room. You can borrow a wheelchair when you visit the Royal Opera House. Please contact the Box Office to arrange this facility in advance. N.B: There is a waiter service available to wheelchair users at the Paul Hamlyn Hall and Amphitheatre Bar. Please notify a member of staff if you require this service. There are accessible toilets on the Ground Floor Foyer level, adjacent to the Auditorium Left lifts (on your left as you enter the Bow Street Ground Floor Foyer entrance – please follow signage). 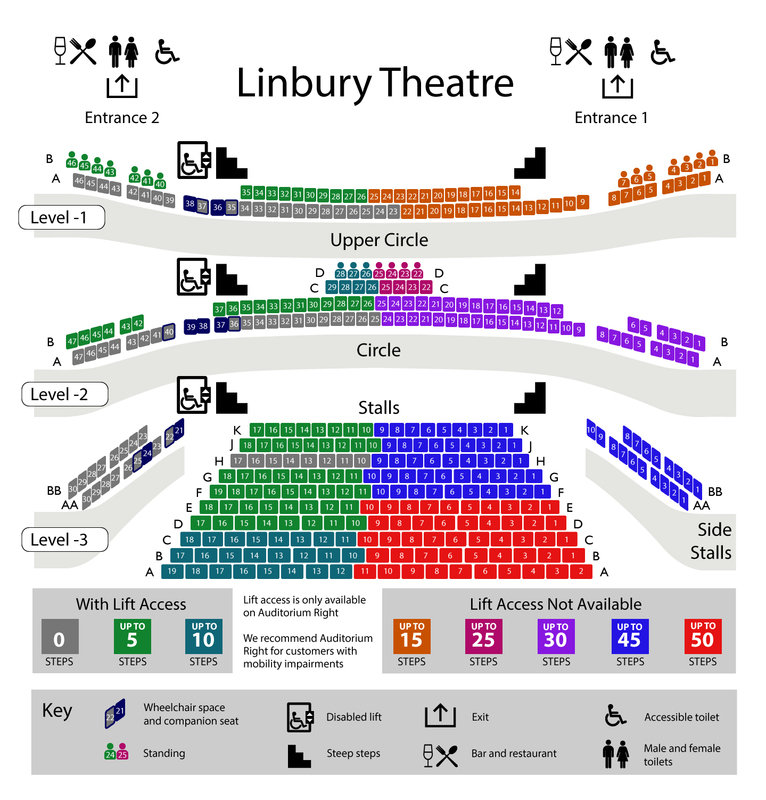 There are also accessible toilets on the Linbury Foyer level (accessed via the Auditorium Left lifts), and on the Amphitheatre Bar level (accessed via the Auditorium Right lifts). If you are attending a performance, there are more accessible toilets on each level within the Main Auditorium. All accessible toilets are unisex, and are equipped with an alarmed pull cord in case of emergency. Our Front of House staff will be happy to point you in the right direction, and if you have any further questions please contact us at boxoffice.access@roh.org.uk or +44 (0)20 7304 4000. There are up to 19 spaces for wheelchair users in the Main Auditorium, which can be made available at every performance. They are in the Stalls Circle, Grand Tier, Balcony and Upper Amphitheatre level. Please note that you can only book wheelchair spaces online if you login as a registered Access Member and wheelchair user. At least one wheelchair space and companion seat will be retained for sale with the Friday Rush Tickets from 1pm on the preceding Friday – please see the Friday Rush section below for further details. Please note that the wheelchair Friday Rush Ticket and companion is available for standard ROH Main Auditorium productions only, not Gala performances or those by a visiting company. There are also two spaces for wheelchair users in the Clore Studio, situated on the centre-right of row A. When booking wheelchair spaces, please inform the Box Office of any further specific requirements. Our Box Office and Front of House staff can also advise you on approximate distances between the main foyer, the auditorium, bar facilities, exits and access toilets. There is step-free access through the entrances on Bow Street and from the Covent Garden piazza. The Box Office Ticket Sales desk is situated on the corner of Russell Street / Bow Street. The Information Desk, Same-Day Ticket Collection, and the Cloakroom are all situated at the Main Entrance on the corner of Floral Street / Bow Street. Counter heights at the Box Office, and most of the bars are designed to be accessible for wheelchair users, except the Paul Hamlyn Hall bar where there is also a waiter service available to wheelchair users. There are five bars and four restaurants at the Royal Opera House. The café is open from 10am every day, and the other restaurants open 90 minutes before curtain up and again during intervals. Our menus are designed to complement the production you will see on stage – from Black Swan Bellinis to Nutcracker afternoon tea – and there’s something suitable for a range of tastes and budgets. All our restaurants are accessible via lift. Visit our Eat and drink page for more details. Auditorium Right provides easy Access to the Amphitheatre Bar and Restaurant, and Crush Room. It is always advisable that customers book directly with ROH Restaurants to ensure that the table reserved is accessible. Please email restaurants@roh.org.uk or phone +44 (0)20 7212 9254. To save time during the interval, we would recommend pre-ordering drinks and snacks at the Royal Opera House Bars. Click here to log into your account and pre-order. At 1pm each Friday, 49 Friday Rush Tickets will be available to buy for Main House performances over the following 7 days (Saturday - Friday). Look for Friday Rush tickets in the Stalls Circle Balcony and Amphitheatre sections of the auditorium; please note the Balcony tickets are for standing places. You may purchase a maximum of two Friday Rush tickets for each performance. Simply go to the Friday Rush page. Please note that one Friday Rush wheelchair space will become available for each of these performances. They become available at 1pm each Friday along with other Friday Rush Tickets but are not bookable via the standard Friday Rush page. Instead, sign into your account as an Access Member Wheelchair User, go to the What's On page and select the performance you wish to book. We offer Friday Rush for almost all main-stage shows performed by The Royal Opera and The Royal Ballet, but a small number of exclusions apply (for example, galas and schools matinees). Depending on national holidays and other events, sometimes (and very rarely) Friday Rush tickets will be released on a different day. In these cases the change of date will be flagged on the Friday Rush page with a week's notice. For some opera productions in the Main Auditorium, one performance is BSL interpreted. These are highlighted in the season guides. If you are a BSL user, we will offer you priority booking and capped priced tickets as near to the interpreter as possible. Please contact the Box Office for more information. Surtitles are supplied for all opera performances, including those sung in English. The surtitles are projected on to a screen above the stage, or to a monitor close to the seats. A small number of performances may offer a number of Relaxed Performances. These have been modified to be more accessible for audience members with Autism Spectrum Disorders or other learning disabilities. Changes made might include: introductions to characters at the start of performances to prevent surprises or shocks during the show; adjustments to the lighting and sound; removal of pyrotechnics or other stage effects that can be startling; or other changes made in consultation with these audiences. There may be more sound and movement from audience members, as well as opportunities for them to take time out from the performance. A Trantec radio system assisted-hearing facility has been installed inside the Main Auditorium and the Linbury Theatre. To benefit from the system, you are welcome to borrow a set of headphones and a special receiver from the Front of House Duty Manager in the Main Entrance foyer. The unit is designed to pick up a radio signal which amplifies the sound and can be borrowed free of charge. Alternatively, if you wear a hearing aid, you may borrow an induction collar which can be used in conjunction with the “T” position of your aid. You may reserve this equipment in advance from the Box Office on +44 (0)20 7304 4000. An Audio Introduction is an aural complement to the printed programme. It provides a detailed synopsis of the work, as well as description of the set, costumes and more. It starts approximately 15 minutes before the start of the performance and five minutes before the end of each interval. Headsets, on loan free of charge, can be collected from the Duty House Manager's desk in the Main Entrance foyer. You may reserve the facility in advance when you make a booking. The same information is also available on Audio CD prior to your visit. Please contact the Box Office to request a copy, free of charge. The Audio Introductions and season Audio Guide are produced for the Royal Opera House by the company Sightlines. Find out more about Sightlines. Large print cast lists and synopses are available on the day of the performance. These can be collected from the Duty House Manager’s desk in the main foyer. Menus in our restaurants are available in large print. Assistance dogs are welcome in all spaces of the Royal Opera House. If you would like your dog to remain with you during the performance, please mention this when booking your seats to ensure you are given a seat with sufficient space. If you prefer, you may leave your dog with a member of Front of House staff during the performance. In the case of an emergency, if it is safe to do so, we will try to reunite a dog with its owner prior to evacuating the building. If this is not possible, staff will bring your dog to the appropriate assembly point. Refuges for customers with limited mobility are located throughout the building. In the event of an evacuation, you will be escorted to the nearest refuge by a member of staff. If you have a dog with you, the dog should accompany you to the refuge. If your dog is not with you, a member of Front of House staff will reunite you with your dog at the earliest opportunity. There is no designated parking at the Royal Opera House. The nearest NCP car parks are in Drury Lane and Shelton Street. There are a limited number of disabled access parking bays in Bow Street and Floral Street which are under the jurisdiction of Westminster Council.